Neighbors Opposed to Privatization at Earle: "Did you hear the one about the Priest, the Nun and 3 Senior Citizens that broke into a Navy nuclear missile storage site in Washington?" "Did you hear the one about the Priest, the Nun and 3 Senior Citizens that broke into a Navy nuclear missile storage site in Washington?" No joke. Honestly, you cannot make this stuff up. 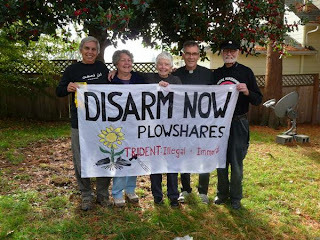 According to Tuesday's Kitsap (Washington State) Sun, "five protesters associated with an international peace movement were arrested Monday after cutting through three security fences to reach an area where nuclear missiles are stored at Naval Base Kitsap-Bangor." Among the intruders (pictured to the right): an 81-year-old Catholic priest, an 83-year-old nun and three 60-somethings. So how did such strong-armed invaders get through three sets of fencing (7-foot fencing: the preferred security measure that NWS Earle will use to deter civilian renters and their visitors from breaking into the secure parts of the base) meant to keep people away from the nukes? BOLT CUTTERS and INGENUITY. The timeline in the Kitsap Sun story would suggest these folks were prowling the base for about 4 1/2 hours, from the time they broke in (2 a.m., under moonlight: "we were hidden in plain sight the whole time," said one of the seniors) until the time they tripped an alarm (6:30 a.m.) trying to cut another chain-link fence apparently very close to the where nukes are stored. (Frankly, they're lucky they're not dead, since base personnel are authorized to use deadly force under such circumstances of invasion). Between this comical and at the same time frightening indicent, and the unrelated death (by ordnance explosion) of a civilian intruder into a blast zone last week at Fort Bragg, NC, it is pretty clear that U.S.-based military installations are far from impenetrable, contrary to what the Department of Navy suggests in the environmental impact statement (EIS) on the Laurelwood civilian housing plan at Earle. Just ask yourself (...and your elected officials): if five geriatrics with bolt cutters can easily break into a nuclear weapons storage site on foot under darkness without being caught by Navy base personnel, how does the Department of Navy's plan to welcome 300 new families of civilian renters at NWS Earle enhance security at one of our largest and most important military ordnance storage facilities? Civilian renters should never be allowed to step foot on NWS Earle, period, lest the U.S. Navy wants to deal with public relations embarassment like this (and, perhaps even worse, potential fatalities)!